Raleigh has come a long way in designing bicycles. From customized bikes to computer-aided designs, every inch of a bike is made with constant consideration of the user’s safety, capacity, and ability. Raleigh also consider the bike’s aesthetic design alongside other specific standards, which is why their Graphic, Color, and Products designers work side by side with their qualified and licensed design and production engineers. Every Raleigh team creates, test, and produce quality bikes that all meet and even exceed the set standards. Most of the reviewers agree that Raleigh bike is a nice bike for a considerably inexpensive price. Several reviewers all noted how easy it was to assemble the bike. One reviewer mentioned that although it’s a men’s bike, his girlfriend still like it more compared to the ladies’ version of it. Another reviewer also indicated how his 14-year old son love the bike as it is light in weight and easy to maneuver. 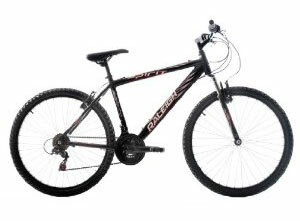 Another consumer who purchased Raleigh Spirit Mens Mountain Bike stated that it is a solid bike for a reasonable price. This Raleigh Spirit Mountain Bike seems to be lacking in good paint finish, as what is observed by several consumers. One reviewer would have liked it better if only for the awfully applied stickers. Not only once did the saddles receive a negative review as three of the reviewers thought the saddle needed replacement. Another reviewer commented on how the saddle was very hard and uncomfortable. Raleigh Spirit’s wheel gears and gear shifters also received negative feedback from a consumer who was pretty wary about the revo-shift of the bike instead of a thumb-shift gear. While the Raleigh mens mtb received mixed reviews, it is still a durable and sturdy bike for its price. The saddle can be replaced and minor details like the gearshift can be overlooked for its solid quality. Overall, Raleigh is still able to keep its legacy and well established name afloat.